DETROIT – Everyone wants a piece of Aretha Franklin's artistic heritage. Church, state, activism, tradition, innovation and celebrity competed for recognition in the marathon homage to the universally admired "Queen of the Soul", here in her longtime hometown. Franklin belonged to the Gospel Church; she belonged to the pop audience; she was a member of the civil rights and women's rights movements; She belonged to Detroit emphatically. At their funeral on Friday, Detroit Mayor Mike Duggan announced news when he announced a plan to rename Detroit's Municipal Riverside Amphitheater, Chene Park, to Aretha Franklin Park. "The mayor has just been re-elected," joked Bishop Charles H. Ellis III. On Thursday evening, a concert entitled "A Folk Anthem to the Queen" was released at Chene Park, with its 6,000 tickets in 10 minutes online. Stretching for nearly five hours, it featured impressive Detroit locals – all of whom, it would seem, had been nourished on Mrs. Franklin's music since birth – alongside nationally renowned singers. 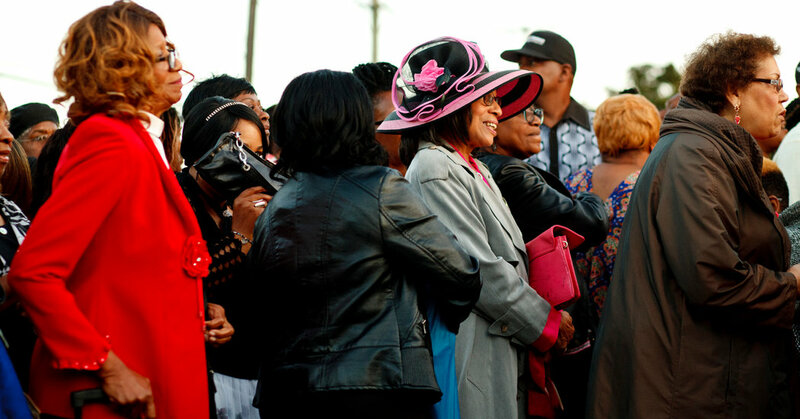 On Friday morning, invited guests and audience crowded the Grand Church of Grace mega church for Ms. Franklin's funeral, which was heralded as "A feast for the Queen" and lasted eight hours of music, sermons, memories and testimonies. There were speeches by former President Bill Clinton, Rev. Al Sharpton, Cicely Tyson, Smokey Robinson, Clive Davis, Tyler Perry and Michigan Governor Rick Snyder, among others. And there was music by Stevie Wonder, Gladys Knight, Chaka Khan, Jennifer Hudson, and gospel stalwarts like Shirley Caesar and the Clark Sisters. Both the tribute and the funeral were broadcast live worldwide. Together, they paid tribute to an artist whose roots were profound, widespread, and thoroughly recognized, but whose vision and achievement were entirely hers: none Template for copying, but an example of the hard freedom of an African American, who is not held back by race or gender. "She was black without apology or apology," said professor and preacher Michael Eric Dyson at the funeral. "And she was American without hassles or exceptions." The tribute concert was divided into genres: classical music (reflecting Ms. Franklin's recent days of operating), jazz standards (the beginnings of her major label career on Columbia), gospel songs – complete with a 25- headed choir – and of course the pop and R & B hits Ms. Franklin by Atlantic and Arista Records. The performances were fervent, eager, and sometimes spectacular, such as Regina Belle's frantic "Rock Steady," Johnny Gill's "Is not No Way," Dee Dee Bridgewater's boldly proclaimed "Skylark" and Tasha Page-Lockhart's spiraling, improvisational "Amazing Grace" and later, on the worldly side, "I have never loved a man (as I love you)." At the funeral, the classic gospel songs that Ms. Franklin recorded on her albums shared the cast with a few pop songs, including "(Let Me Feel It) a Natural Woman," by the pop singer with America's most recent album # 1, Ariana Grande. The finale was also a secular song: Stevie Wonder swore eternal love with "ace". A funeral is a ritual, not a concert, but with current cameras and a worldwide audience, the performers poured it: Chaka Khan glides higher and higher in "Going Up Yonder" (reading lyrics of a strategically supported fan); Shirley Caesar and Tasha Cobbs preach and rejoice in "How I got over it", Yolanda Adams and Bishop Paul Morton ride in "Mary Do not You Weep" and "Jennifer Hudson straps and calls" Amazing Grace ". The Church claims Mrs. Franklin rightly as the daughter of the preacher who has brought everything she has learned from gospel music – the timing, the dynamics, the ornaments, the voice, the call-and-response with their backup singers, the kind how she plays piano – in the hits that would make her a star for the next five decades, and in her countless live concerts. "When Mrs. Franklin got into an artistic impasse, she would revive herself by Ms. Franklin sang in 1968 at the funerals of Rev. Dr Martin Luther King Jr. and in 2005 at Rosa Parks, Ms. Park's funeral was also held in the Greater Grace Temple e continuity was symbolic and unmistakable. But the church was only part of Mrs. Franklin's education and the style she was forging. She also grew up listening to jazz, blues and R & B in a house that welcomed visits from tourist musicians. And in the 1950s and 1960s, like other preachers across the country, her father was a civil rights activist, an ally of Dr. Ing. King. Growing up in a separate era, Mrs. Franklin not only embraced the principles of faith, but also the determination to make earthly life more just. At her funeral, there was just as much praise for her civil rights representation – she toured to King's payroll was billed as a deposit for Angela Davis in 1970 – as for her music, while some speakers, such as Mrs. Franklin's longtime friend of Rev. Jesse Jackson, used the pulpit to achieve voting for this year's midterm elections. Franklin had to move beyond gospel music to become a superstar. Their breakthrough in 1967, after years of working in and out of gospel and jazz, was to bring pop precision and impact – "Think" only runs 2:20 – to songs that did not restrict their voice or limit their pride. Over the decades, she found her again, she wrote, or (as with "Respect" and "I say a little prayer") to win her over. She sang of pain to exorcise it; She sang of strength to spread it. She also set an example as a tough business woman. Eulogies at her funeral made it clear that Mrs. Franklin, unlike some superstars, could not isolate herself from the city she grew up in. She presented furs and clothes on stage and Louboutin red-soled shoes in her coffin, but she understood what others were going through. A Detroit radio personality, Mildred Gaddis, recalled that Ms. Franklin used to call a local news anchor after seeing segments of families in trouble, and then sent them a check. Ron Moten, a neighbor, said he asked Ms. Franklin to visit his mother in a dorm on her 90th birthday; Mrs. Franklin said to him, "I'll think about it." Then she appeared with her band to play a one-hour concert for all residents. Many of her friends confirmed that with Mrs. Franklin's politics was always a topic of discussion. And while direct protest songs are a tiny part of her huge catalog, there was no doubt – in her voice, her lyrics, and her entire public presentation – her basic message that, she famously said, "Everyone wants respect, everyone needs respect." There is no formula, no simple demographics or loyalty or parameters to create an artist like Aretha Franklin. To imitate the notes she sang – as some of her admirers did on stage – is just technical facial expressions, far from her true lesson of creativity. Understanding what Ms. Franklin has coined underlines only how fully she has synthesized and then transcended everything. But the sacred and the secular, the idealistic and the hedonistic, the political and the aesthetic, the local and the global, all confirm their role in their music. There is enough for everyone.